All tire pressures (including the spare) should be checked when the tires are cold. “Cold Tires” means the vehicle has not been driven for at least three hours or driven less than 1 mile (1.6 km). Recommended pressures must be maintained for the best ride, top vehicle handling, and minimum tire wear. For recommended inflation pressure refer to “Tire and wheels” in section 8. 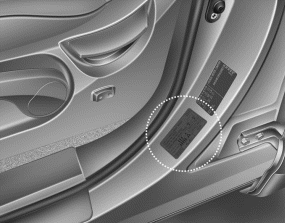 All specifications (sizes and pressures) can be found on a label attached to the vehicle. Severe underinflation (10 psi (70 kPa) or more) can lead to severe heat build-up, causing blowouts, tread separation and other tire failures that can result in the loss of vehicle control leading to severe injury or death. This risk is much higher on hot days and when driving for long periods at high speeds. Underinflation also results in excessive wear, poor handling and reduced fuel economy. Wheel deformation also is possible. Keep your tire pressures at the proper levels. If a tire frequently needs refilling, have it checked by an authorized HYUNDAI dealer. Overinflation produces a harsh ride, excessive wear at the center of the tire tread, and a greater possibility of damage from road hazards. Warm tires normally exceed recommended cold tire pressures by 4 to 6 psi (28 to 41 kPa). Do not release air from warm tires to adjust the pressure or the tires will be underinflated. Be sure to reinstall the tire inflation valve caps. Without the valve cap, dirt or moisture could get into the valve core and cause air leakage. If a valve cap is missing, install a new one as soon as possible. Overinflation or underinflation can reduce tire life, adversely affect vehicle handling, and lead to sudden tire failure. This could result in loss of vehicle control and potential injury. Check the pressure of your spare tire each time you check the pressure of other tires. Never overload your vehicle. Be careful not to overload a vehicle luggage rack if your vehicle is equipped with one. Worn, old tires can cause accidents. If your tread is badly worn, or if your tires have been damaged, replace them. © 2019 www.hyundaisantafemanual.com. All Rights Reserved.